The First (0-18) Roulette, using a 20-sided Die. ​Exciting and Space-Saving. House-Edge 5.26%! 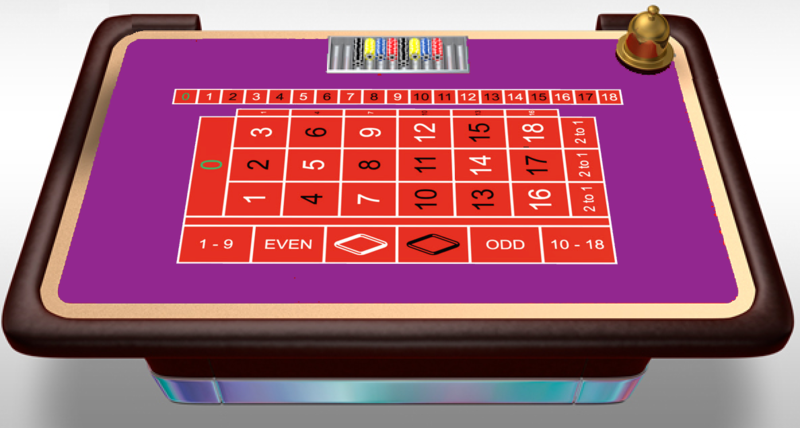 ​Roulette-18® Rollette® uses a 20-sided Die, and a unique table layout that does not require a Roulette-sized table. ​Like traditional Roulette, Players can place: Straight-up, Split, Street, Corner, Line and Even-chance bets. 1. 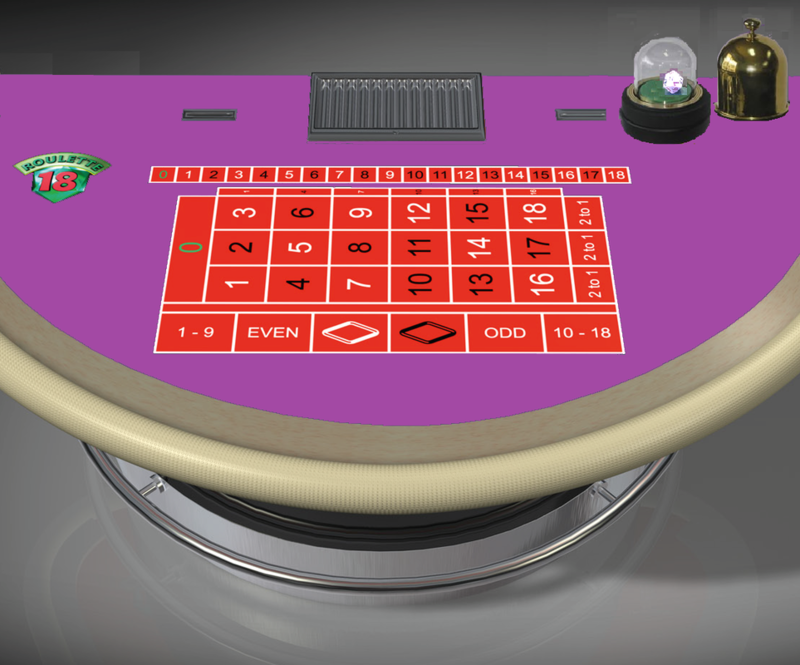 Players place their bets on the Roulette-18® layout, just as they would in ordinary Roulette. 2. 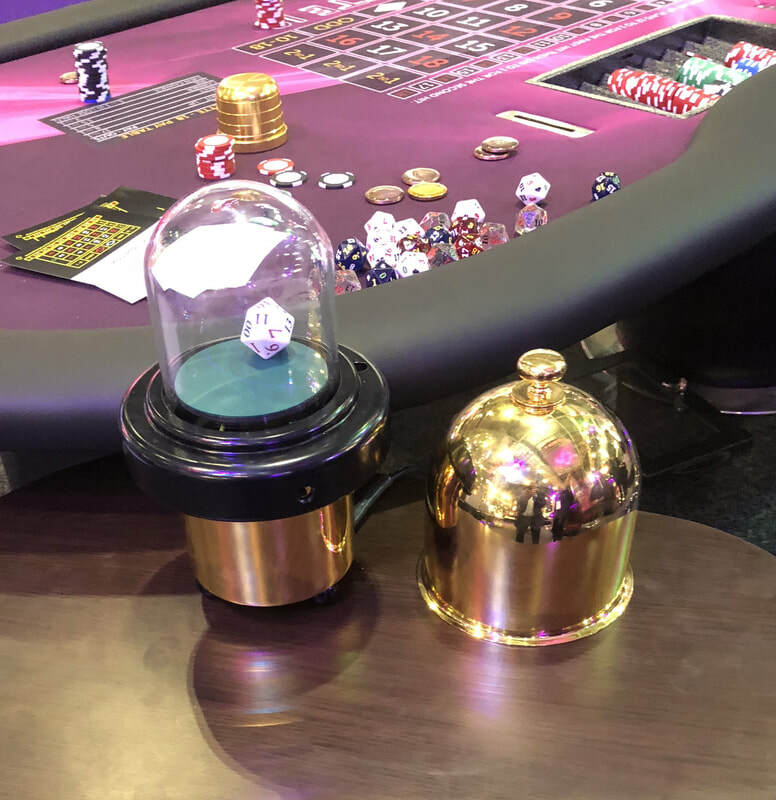 A Roulette-die is rolled in a shaker and then exposed. If the roll is a double-zero (00) all bets remain in action and the die is rolled again until a non-00 winning number is determined. 3. ​According to the bets and the winning number. Dealer then collects all losing bets and pays winning bets according to the Pay-table. 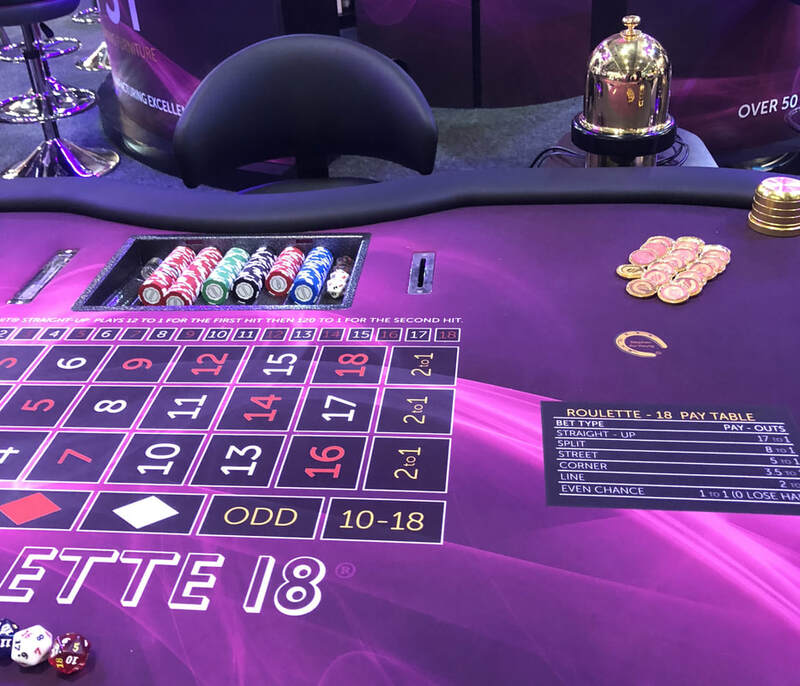 Roulette Link-Bets® offers Split and Corner betting between numbers in the First and Third columns that were previously not possible because they are not adjacent. Link-Bets are made possible by the addition of a Fourth column which duplicates the First column. In other words while columns with 1, 2 and 3 existed, allowing for a split bet between 1 and 2 or 2 and 3, there is now a fourth column with the number 1 again thus allowing for a split bet between the two adjacent numbers of 3 and 1. NOTE: ALL Roulette-Numbers from 4 to 33, NOW has Four Split-Bets and Four Corner-Bets. For added excitement, casino operators may choose to include the Double-Hit® betting section on their Roulette-18 layout. The Double-Hit straight-up is a proposition bet based on two consecutive roll of the die. 1. 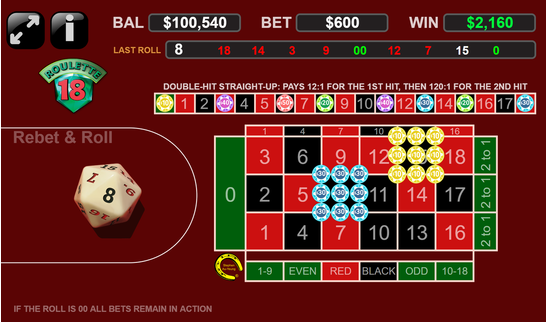 The Player places a bet on a single number in the Double-Hit section of the layout. 2. If the Player does not hit his number, he loses his Double-Hit bet. 2a. If the Player hits his number, he’s paid 12-to-1 and the bet remains in play for a second round. 3. If the Player does not hit his number in the second round he loses his Double-Hit bet, but he keeps his first-win 12:1 payout, for a net win of 11 units. 3a. If the player hits his number on the second round, he’s paid 120-to-1 and his original bet is returned, for a total net-win of 132 units. Patented and Registered Design. ©2012, All right reserved.